Keep in mind this is an ACTIVE CRIMINAL “GOVERNMENT” CRIME SCENE and FURTHER CRIMES ARE BEING PER”PET”RATED! The Town of Paradise, California has and “IS” under attack! CALL TO ACTION * Please take even one action now! You will read in the links below about the situation and that many experienced groups and expert experienced animal rescuers are being turned away. Animals taken out of current shelters some taken out of the county and transported back into the Butte County into less desirable conditions. I talked to Joy of Field Haven Rescue who was given 24 hours to shut down her vet rescue for cats. She was heading back up to start preparing to shut down. This is the overall resources site that is updating several times a day, transcribing meetings, and networking to help fulfill needs on the ground. live away from the fire zone, please contact the officials and news agencies, below! If overwhelmed, do Just One Thing. Injured and scared pets and livestock are no longer being rescued or pulled from the CampFire area. On Thursday, November 22, the North Valley Animal Disaster Group (NVDAG) and Butte County Animal Control blocked all access to the animal rescue organizations who had been assisting with rescuing and feeding animals behind the lines. These evacuation teams of trained and qualified individuals had been rescuing animals from the first day of the fire and providing liaison for many of the fire survivors concerned for their pets Many of them have active fire experience and have served in multiple, dangerous disaster situations. Hundreds of volunteers were blocked out of the fire area, which left the rescue efforts (which had included them the up until that point) understaffed. Subsequently, a select few of the previous volunteers were allowed access again for animal support; however, they were restricted to feeding and watering animals sheltering in place, and no search and rescue of animals was to continue. Even with the few additional personnel, there are inadequate resources in the field to support the remaining pets and livestock with shelter-in-place support. Experienced and trained volunteers saw many pets in need of rescue as recently as early this past weekend, before they were blocked out and rescue efforts were discontinued. Animal owners have expressed great concern. They are experiencing undue stress knowing their pet may be at large and injured, but will not be rescued. Animal owners have lost everything; their pets are their family, and their mental health is suffering. Should shelter-in-place efforts continue without adequate rescue personnel, injured pets will perish before they can receive medical attention. Temperatures are dropping, conditions are wet, with toxins on the ground, and there are not enough personnel to feed and water shelter-in-place animals daily. Injured animals do not typically expose themselves in order to find food and water; they hide, where they are vulnerable to predators and the elements. Owners in recently repopulated areas have returned to their homes to find their pets without food or water, starving and in poor physical condition, even though they were assured their pets were being cared for. Haven’t they suffered enough? 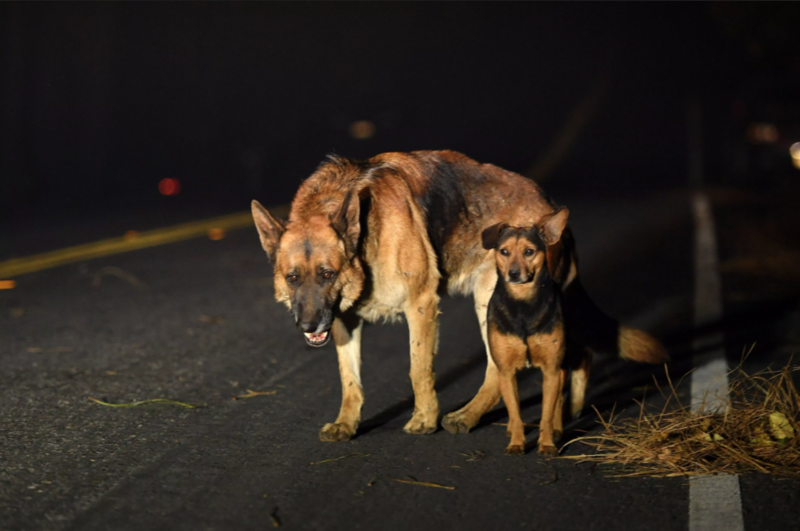 While there are personnel in the fire zone, there are not enough to care for the animals being “sheltered in place” and they are no longer searching and rescuing injured, burned or starving animals. This is unacceptable for both the animals’ survival and for the undue stress for their owners, especially when there are over 100 certified and well-trained rescuers and trappers available to assist. This is an overwhelming situation, but your voice is powerful and important. If you’re a pet owner in the fire area, join with others and make a plan together to share tasks, below! If you live away from the fire zone, please contact the officials and news agencies, below! If overwhelmed, do Just One Thing. Please (A) contact the following officials and let them know that you (1) strongly object to certified individuals and experienced volunteers from established volunteer rescue organizations like Cowboy 911, Hold Your Horses, and Fieldhaven, being blocked from animal rescue operations by NVADG/Animal Control in the Camp Fire evac zone; (2) ask that those volunteers be allowed back into the evacuated zones, as in previous CA fires, to rescue animals immediately. Butte Co. Animal Control (AC) and NVADG have done what they felt they could, but are not equipped to handle this unprecedented magnitude of need and, as a result, countless animals are suffering. They, and their owners who have been through so much already, need your help now. Please (B) contact major news organizations and ask them to investigate this unprecedented situation (C) If you donate to any of the agencies serving animals in the area of the fire, please contact them and ask them to explain what is happening to animals behind the lines in Butte County. (D) Easy! Comment on any official you tube videos (e.g., Matt Gates’, Paradise Public Information Officer’s video here) and on official FB pages (see below). If you don’t do this, officials figure residents/pet owners are in agreement with the situation as it is. 1) Who made the decision, after the first week, to no longer allow experienced volunteer rescuers to rescue pets in the fire zone? 3) Who is their boss, in the chain of command? 4) Is there an existing policy reference specifying the criterion upon which this decision was made? 11/28: If you’re an animal rescuer and have been turned away, or your organization has been shut down (Fieldhaven), please email Elizabeth with your experience, ASAP: bettemcasey@gmail.com. Please communicate your concerns on local official youtube pages, including Matt Gates’, Public Information Officer’s video here, as well as phoning, tweeting, messaging, or writing a letter to the editor of your local or national newspaper: New York Times, Los Angeles Times, Chicago Tribune, San Francisco Chronicle, Sacramento Bee. Send in a tip to ABC News, CBS News, CNN News, CSNBC, MSNBC, Fox News, NBC News, BBC World, KQED. “Do you have questions about what happens in the aftermath of the Camp Fire? Send them to us! Then tune in each weeknight at 6:30pm, starting 11/26, for a special 1/2 hour program, After Paradise, where we will cover the aftermath in-depth, with answers to your questions. North State Public Radio, 530-433-4887. Listen live here. Make a complaint to the California Attorney General on any nonprofit organization here. Information on nonprofit complaints here. Yuba County Office of Emergency Services and County of Sutter Office of Emergency Management (OEM) and Yuba-Sutter Domestic Animal Disaster Assistance are coordinating the animal disaster response in Yuba County now (where Fieldhaven was shut down 11/28). Animals reported being seen behind the lines. Outside NVADG/AC rescuer volunteers who were allowed in to rescue until last week, still not allowed to rescue. Please go to community meeting tonight! Crucial to let officials know pet owners’ and others’ feelings about this, to demand answers and investigation, and to open the lines to rescuers. Camp Fire pets and their owners should not have to suffer any more, and they’ve certainly suffered enough. It is imperative that local pet owners make their views and needs known. THANK YOU TO ALL WHO HAVE HELPED! The North Valley Animal Disaster Group wants to publicly acknowledge and thank all the volunteers who have helped make this unprecedented disaster run as smoothly as possible. Without mutual aid from recognized non-profit organizations, we could not have helped as many animals as we have. Some of the groups we have partnered with in this emergency have been: International Fund for Animal Welfare (IFAW), Red Rover, Humane Society of the United States (HSUS), American Humane Association (AHA), and American Society for the Prevention of Cruelty to Animals (ASPCA), among others. Rescue and shelter-in-place efforts are being handled by organizations approved by Butte County Animal Control and the Incident Management Team. Volunteer groups, such as the North Valley Animal Disaster Group, do not determine which teams are allowed into the evacuation areas. Groups not approved to work beyond the evacuation lines by Emergency Management are not being allowed past the roadblocks. The main issue with these groups is that they are not trained in the system designed by Butte County to keep track of animals and ensure the animals will be returned to their rightful owner. (emphasis added) As such, when they remove an animal from its shelter-in-place location, they are essentially illegally removing the animal and making future reunification with the owner much more difficult. Only groups that are approved through the Emergency Management leadership are allowed to assist animals behind the fire lines, both for the safety of the responders, as well as to keep track of the animals for purposes of future reunification. The North Valley Animal Disaster Group, along with assistance from mutual aid Animal Control Officers, and National Guard troops, are sending over 50 teams a day into the field. Yesterday we visited over 600 locations behind the fire lines and delivered over 87 tons of food to needy animals. We could not do this without your support. We continue to work alongside our partners until every animal is reunited with its owner. There is so much more to do but our role as working under the direction of Yuba County Office of Emergency Services and County of Sutter Office of Emergency Management (OEM) and partnering with Yuba-Sutter Domestic Animal Disaster Assistance has come to a close. We have provided shelter for nearly 100 cats. We have reunited many families with their lost cats. Thank you to these great partners for providing the resources to do a great job. Whiteaker Hall at Sutter County Sheriff’s Posse is the most incredible venue we could ever wish for. Yes, we have done a helluva job. One we couldn’t have done without everyone’s support. The shelter here at 44 2nd Avenue in Yuba City will be closing tomorrow, 11/29. While we had truly hoped we could continue on with aiding the recovery effort, our offers to Butte County to assist as a supporting organization have been repeatedly gone unanswered. If at a future time we can step back in to help with the recovery effort, if we are able we will absolutely be there. Because helping cats and people in need is what we do. Thank you to our partners, Alley Cat Allies, Found Animals Foundation and all of YOU. In addition to the above “who to contact,” please communicate your concerns ASAP on local official youtube videos, including Matt Gates’, Public Information Officer’s video here. Are you, or do you know someone not allowed to cross the fire lines to rescue pets still left there, any time in the past 2 weeks? Please contact, or have them contact, bettemcasey@gmail.com, TODAY with details of story. 9:32 pm: People were able to speak with attorneys at tonight’s meeting who said they would help try and figure out how to resume rescue operations. In the meantime, mark your calendar and get your questions ready (e.g., “Why aren’t more experienced rescuers/trappers allowed to get surviving pets off the hill?” “Who made the decision to “shelter in place” and stop rescuing?” “How do we get our pets out of that toxic environment?” Help us to help them by letting your local officials know that you do not agree with the inadequate resources currently in place for the Camp Fire surviving pets! The Butte Co page just posted this: COMMUNITY MEETING…Thursday, November 29, 2018 7-9pm, Pleasant Valley High Performing Arts Center, 1475 East Ave, Chico. Butte County and the Town of Paradise are partnering with other local, state, and federal agencies to host a community meeting for fire survivors to provide an update on search and recovery efforts and discuss available resources: https://www.facebook.com/events/714269138944945/ 2:30 pm: Pet owners and concerned others: Those working on the ground in the evacuated zone (utility companies, emergency services) reported seeing many pets behind the lines just yesterday. Ask for more, experienced pet rescuers/trappers to be allowed behind the lines to rescue animals immediately. Ask for pet owners to be escorted to their property to search for their pet. There are numerous, first-hand accounts of pets who have not been rescued but seen; experienced rescuers are required in a difficult situation such as this, to coax hiding, frightened animals out despite the noise. Tell your friends: pet owners must unite and press for answers and additional experienced, volunteer rescue access, immediately. Consider spreading the idea of leaving out pet food just outside the evac zones, and requesting AC (Animal Control/NVADG) to leave pet food stations in a line toward the nonevac zone, so pets will move OUT of the evacuated areas on their own. Consider joining with others, making covered cat-litter-box shelters with hay inside for warmth for cats and small animals, leaving them just outside the evac zone. ***Rain and snow are coming*** Here is a post from Will Dyslin (confirming), Yuba Shelter Food Bank Lead, now working to feed animals with NVADG/AC: “…animals are being fed in the fire area everyday no stop. We have pushed out over 60 tons over the weekend. I can’t tell you how many animals have been taken out because that’s not part of my job, but I know lots have come out and tons have been fed. Even the deer and wildlife got fed. Yes, if a bag of food gets broken we put it in buckets and the USDA Animal Control and NVADG take it out and drop it for the wild animals who have lost their homes..Army [NOTE: must mean Nat’l Guard] came in today, well weekend warriors at least, but they rolled in with 20 5 ton trucks and 10 1 tons to help us set up 3 new drop points where people can go get hay and animal feed…” Concern appears now to be whether injured/scared animals will/can come out to feed, and leaving pets up in evac zone in toxins and upcoming concerning weather. Having additional, experienced rescue volunteers working with NVADG/AC would alleviate that concern. 6:35pm: Experienced rescue volunteers working under NVADG did bring some cats out today. One such rescuer saw many deer, one cat, and was able to trap another cat. Unconfirmed: burned cats being brought out for treatment; are easier to catch now because they are weak. Trying to confirm whether or not rescues will continue tomorrow and going forward. FEMA to be taking control tonight. Not sure what that will mean for rescue efforts. 11:50 am: If you have a missing pet behind the fire lines, it’s imperative you call NVADG hotline 530-895-0000 now, and consider posting pic, detailed description, address ASAP here. 10:30 am: At least some volunteer animal rescuers sworn in this morning. Will follow situation to determine whether or not this continues beyond today, and will provide updates on today later today. 11:00: this may be the last day of animal rescue, as FEMA is moving in. This is the overall resources site that Veronica is updating several times a day, transcribing meetings, and networking to help fulfill needs on the ground.